As a growth-focused ecommerce merchant the traffic you get to your store is precious. You’ve spent a lot of time and resources growing your ecommerce business. When you’re putting together a plan to improve conversions it’s imperative you identify the problem and make data-driven decisions. But… you don’t want to waste that hard-won traffic on a battery of multivariate tests that won’t contribute to lifts in conversion. Before you start the process of optimization and testing you should turn to the data you have in Google Analytics. Use your analytics tools to identify the pages with the best opportunity for lifting conversions while also identifying specific page issues. Keep in mind Google Analytics and other tools for heuristic evaluation, user testing, and customer feedbackchannels won’t lay the problem out in front of you. It’s never that easy, right? However, interpreting the data you have readily available in key reports can lead you to pinpoint trouble areas. Digging deeper will reveal the most likely problems, narrowing down the changes and improvements you can make as part of your ecommerce optimization strategy. You may already know this but I want to stress that you should never analyze the traffic to your store as a whole. Those are average numbers. You don’t want to calculate based on averages because your customers aren’t average. You know from your marketing initiatives that you need to segment your audiences to improve success. That segmentation is necessary here as well, because works in one audience segment may not work in another. When you compare new vs. returning visitors, different devices and browsers, and buyers vs. non-buyers you’ll see a notable difference in performance. Add a segmentation to your audience to better understand diferences between then. Go to Audience > Overview and add a new segment, or edit the “all users” segment to begin choosing the segments you want to target, then click “apply”. Now we can start running those reports. While general demographics aren’t the most reliable data primarily because your tracking code doesn’t really know who is visiting the site. It’s logging the user information it has available. In some cases you might have a college age son searching and visiting using the device his 55+ year old mother. Still, part of any successful ecommerce optimization strategy is knowing who your audience is and how it (your content and message) appeals to them, how they interact with your site, and how those interactions contribute to your revenue. Once there, look at the data for “Browser” and “Screen Resolutions” and Primary Dimension. There’s a reason you split your mobile and desktop segments – mobile represents a significant share of online traffic. For many users it’s the preferred method of researching purchases and browsing the web. As of 2017, mobile traffic represented more than 50% of all website traffic worldwide. It’s no surprise when consider there are over 4.9 billion unique mobile users. That’s 66% of the world’s total population on mobile. Monitor mobile conversion for abnormally low conversion rates. In the example above the mobile conversion rate is noticeably low, roughly a quarter of desktop conversions (24%). The average ecommerce conversion rate for mobile should be closer to about 50% of desktop conversions. That’s a flag for an opportunity to improve the mobile experience. Note that tablets account for only around 4% of traffic so, any optimization for tablets should be given a lower priority. What you want to look for is the comparison between mobile, desktop and tablet conversion rates specific to add to cart conversion and ecommerce conversion. As a rule of thumb mobile conversions are considerably lower than desktop and tablet and it’s crucial to pay attention to mobile conversion optimization According to Smart Insights, first quarter global conversions for desktop were 3.63% while smartphone conversions averaged 1.25%. Theres a consistent gap between mobile and desktop conversions around the globe, not just in the United States. Source. That can be due to a variety of reasons and doesn’t necessarily indicate a problem. In fact, many customers shop across multiple devices initiative a cart on their phone before switching to a desktop or tablet to complete the purchase. The next step with mobile is to dig deeper. Are your mobile conversion rates lower than you expect? Open the device report to get a bit more granular. Monitor device engagement and performance to ensure no single device or device type is triggering usability issues that the customer experience and conversions. I recall one client with a substantial portion of its regular visitors accessing the site via iPhones (more than 70%, actually). That kind of insight made it easier for the team to focus our optimization efforts and lift conversions on a large segment. Site speed is a critical factor in conversion, especially with mobile users. Nevermind that site speed is one of many ranking factors users by Google’s algorithm – site speed problems are as much a user experience problem as they are a conversion killer. Few things will send a customer packing like forcing them to wait for content to load, carts to populate, and checkouts to update. Don’t expect them to return either – people largely rate their experience on site performance, and 79% of users who aren’t happy with your sites performance are less likely to purchase from you again. As far as conversions go, a single second delay in load time can produce a 7% reduction in conversion (check out what tips you can steal from Apple’s online store to boost your conversions). Monitor site speed performance to identify areas where performance lags. Review and sort the data by the number of pageviews; address pages with the most traffic and act quickly to prevent your most popular pages from driving away frustrated customers. Note: Be sure to compare mobile numbers to desktop performance. As your customers progress through the funnel you’ll find areas where they exit rather proceed. In order to create a funnel you’ll need to first set up at least one goal in Google Analytics. Kissmetrics has a very in-depth guide on setting up goals and funnels. Keep in mind that funnels in Google Analytics don’t allow for advanced or cross-device segmentation. You can do a manual funnel assessment by creating a custom report and performing an analysis on “users” for each page along the path to conversion. 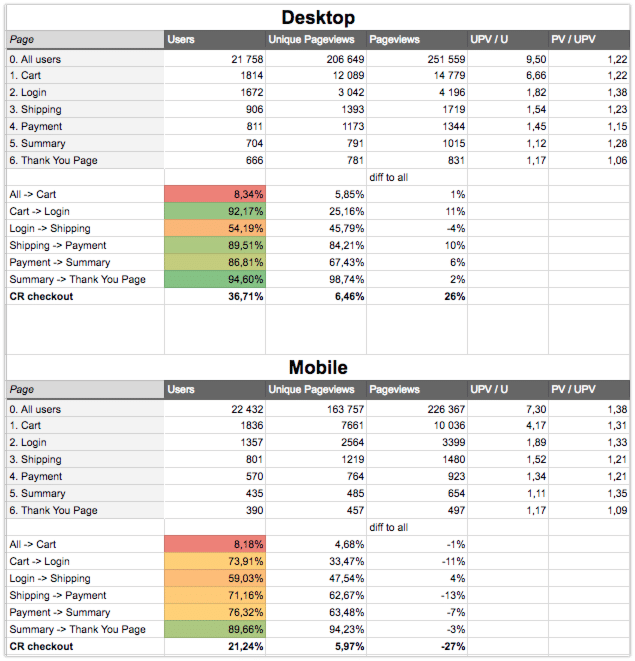 The custom user report provides a period snapshot of user visits to critical pages along your conversion path, showing differences in page visits to help identify where customers may be drifting out of your funnel. A custom user analysis report lets you see how various user segments perform along your established conversion path and where they may be drifting out of your funnel. Use the goal flow report to track loopbacks and funnel steps that take place out of order. Your conversions and ecommerce transactions will be tracked in Google Analytics and credited to the last campaign, organic search, or ad responsible for referring the visitor before their conversion. Multi-channel funnel are preferred over similar ecommerce conversion reports as these more accurately track the customer journey. For example, if your data indicated that it takes customers an average of four visits over the course of a week to pull the trigger on a purchase you might consider testing messaging and campaigns that create a sense of urgency on product pages. 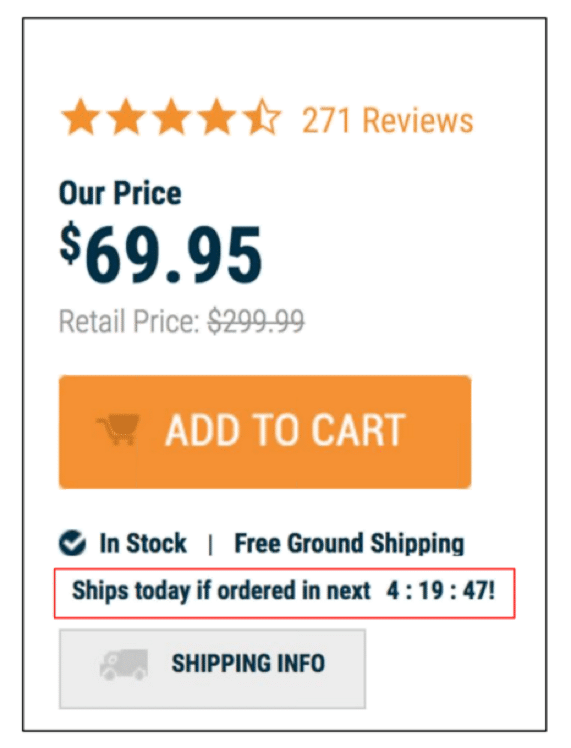 Use urgency, like this countdown timer, to encourage customers to take action lest they miss out on your offer. Source. Google Analytics is nothing short of a wealth of information, but the generic top-level data isn?t sufficient for uncovering the funnel leaks and opportunities to improve conversions. While the reports I’ve mentioned here aren’t the only reports you should monitor, they provide significant insight and should be high on your list. Of course, there are countless metrics and reports at your disposal, and you should track metrics aligned to your business goals. With that said, these reports can help you dissect the customer conversion path to identify problem areas and make data-driven decisions that will provide that much-needed uplift in conversions. Analysing data is a crucial element of ecommerce optimization but you should also know the wider aspect of ecommerce development. Find out the future of ecommerce development and get our latest ebook on this topic!